A pair of socks for my endless jar of honey. 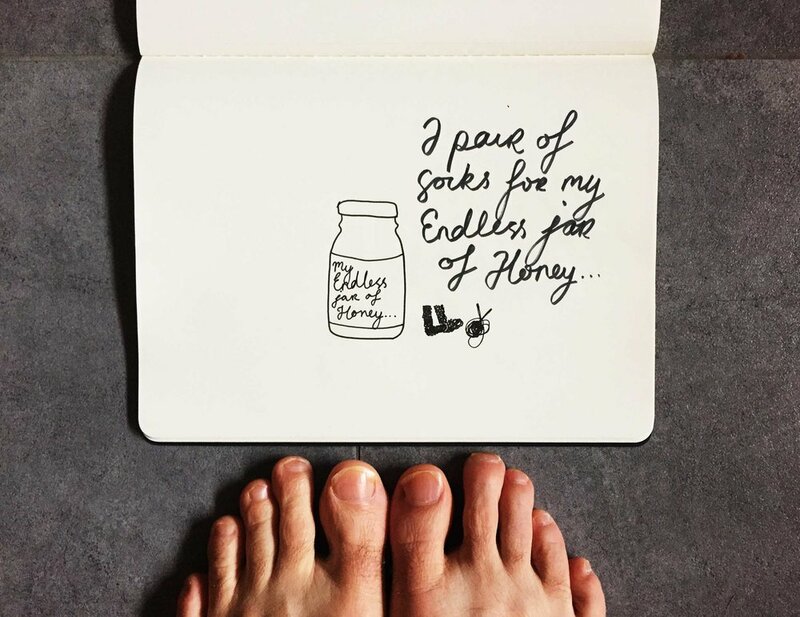 A pair of socks for my Endless Jar of Honey... Drawing Luke Hockley. I just want to sit and knit this pair of socks. It’s not really that practical to do that all day. It is actually a little bit hard on my body. But I am compelled to knit. There is something about watching a practical object appear like magic out of a ball of wool that gives me deep satisfaction. The socks I am knitting are not going to fit me. I was sad when I realised I had started knitting the wrong size pair of socks. But then I realised that there was an endless jar of honey in the house that was going to love to keep warm with a pair of hand knitted woolen socks. That feels even better than wearing them myself. Newer PostBring on the adventure.